See the attached program for details. The conference runs 8:00 am – 4:30 pm at the Viscount Suites Hotel, 4855 E. Broadway Blvd., Tucson. 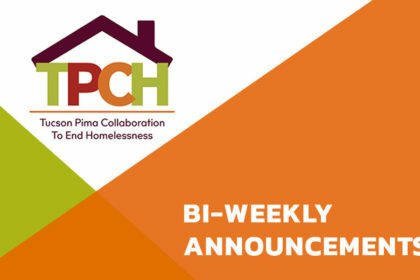 Making Homelessness History! features 16 breakout sessions by expert presenters in four tracks: Data-driven, Evidence-based Practices; Special Populations; Housing and Real Estate; and Professional Ethics and Boundaries. See the attached schedule. Registration, at $80, opens late next week, and includes continental breakfast and luncheon. Plan now to attend. Volunteers, who must make and meet a firm for waived registration, are sought for the following positions. Four (4) room hosts. One each will be stationed in each of the four breakout rooms to: orient speakers to the AV equipment; introduce speakers; assist with handouts; assist with questions and answers; and hand out surveys. Three (3) registration workers starting at 7:45 am to: assist with name tags, programs and at-door registration (cash and check only); and rotate staffing the registration tables all day. Two (2) audio-visual assistants, familiar with PCs, projectors, and their connectors, to be on-call to troubleshoot and assist as needed. IMPORTANT REMINDER: The deadline for local submission of all applications for the FY 2018 HUD CoC Homeless Assistance Grants Competition is 11:59:59 pm (before midnight) on Thurs., Aug. 16, 2018. This includes all applications in e-snaps and those local applications required for all new, bonus, Domestic Violence bonus, and expansion grants. For further details see www.tpch.net/fy-2018-nofa.html. Please direct questions and requests for assistance to NOFA2018@communitypartnersinc.org. The 2018 Veterans Resource Fair (one-day Stand Down) is Weds., Aug. 15, 9:00 am – 2 pm, at the Grand Luxe Hotel, 1365 W. Grant Rd. Las Artes, a county GED program, at 23 W. 27th St., is recruiting youth ages 17 to 22, who can score at 5th grade or higher on the TABE, for classes starting Sept. 3. Testing is at 8:30 am Mon.-Thurs. 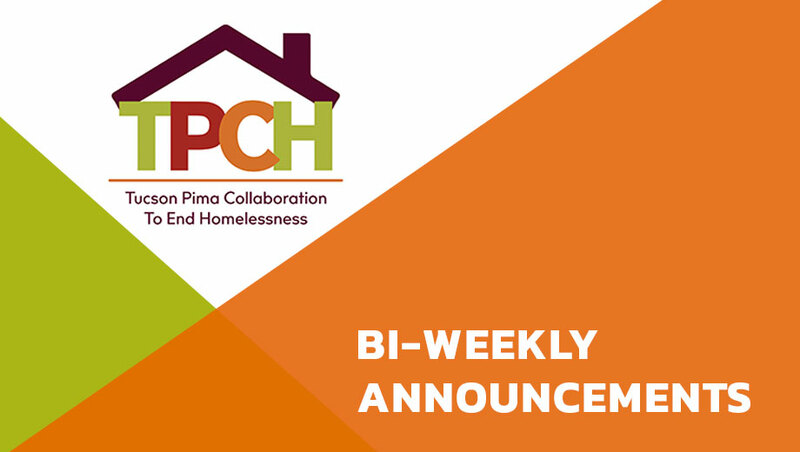 To learn more contact Patty.Short@pima.gov or call 520-742-5112.